Having lived in our new house for about a month now we have a pretty good idea of the things we want to do to make it perfect. A big hammer and Gumtree have been helping us along. So far although I have been finding things on Gumtree it has been my husband who has been collecting them, the fact he drives a truck helps. However we were looking for a Belfast sink for the new utility room and one came up close to where I work. It made sense for me to go check it out after work one day. Getting to the address was fine and the sink was perfect, but when it came to getting home again I was lost. It was dark, raining hard and the directions I had would only get me back to work not home. "Continue along Milton Road for 3 miles..."
Time to try out Google maps on my phone as a sat nav. 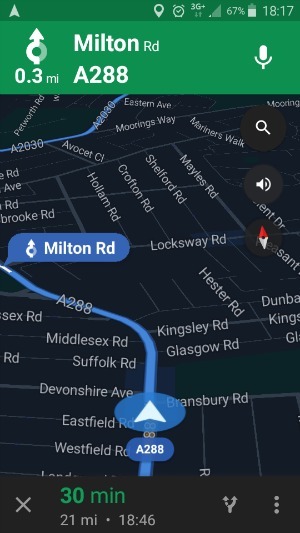 I have never had to use it as a sat nav before, although I refer to it all the time, as I do a lot of the same journeys over and over, or have someone with me who can navigate. My husband had already shown me how to make it work which was good as I am not sure I would have worked out the symbols straight away, but once it was going I was quite impressed. Although I would have liked to be able to ask her to repeat herself sometimes, particularly when there was a reasonable gap between directions, I really liked how the screen darkened in sat nav mode meaning there was no glare in my dark car, but it was still really easy for me to give it a quick glance to see what was coming up next. This was invaluable as I drove through twisty residential streets which made no sense to my sense of direction! It felt like a useful tool rather than a distraction to my driving and got me home without any problems, even when I did not follow her first set of instructions as it would mean turning my car round. I will not need it for most of my journeys but I know that in future a new complicated route will be made easier with this tool even if I have not planned one.